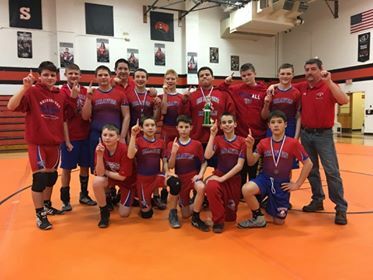 The Bridgeport Middle School wrestling team recently won the 2018 Harrison County Middle School Wrestling Championship. The Braves finished the event with four county champions and even more individuals that finished as the runner-up in their weigh classes. This year's Harrison County champions were Kamar Summers, Bryce Carnes, Bladen Roush and Conner Arnett. Summers finished the year undefeated. BMS had six finish in the number two spot during the meet. The second place finishers include Aaron Murphy, Clayton Hammond, Ashton Nardella, Liam Mayle, Brayden Thomas and Tannen Boggs. The other middle school teams in attendance were Washington Irving, South Harrison, Lincoln, Mountaineer Middle and Notre Dame. The Hilltopers finished in second place. Bridgeport Middle School's program is led by Coaches Kenny Eddy and Brant Carnes. Eddy and Carnes have a combbined 25 years of experiencing coaching the sport. Editor's Note: Photo submitted to Connect-Bridgeport.